Development of bioenergy systems is gaining momentum globally and bioenergy stakeholders are numerous and their perceptions are diverse. The study explored perceptions of bioenergy stakeholders by reviewing scholarly literature and complementing and validating them against primary data. 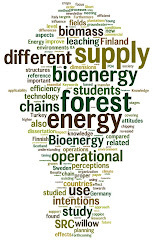 The number of publications on stakeholders’ perceptions of bioenergy is increasing while geographical focus and stakeholder analysis vary considerably. Among the stakeholders, biomass producers, public, and experts are widely studied groups while the least explored are students and private developers. The majority of the studies have been conducted in North America and Europe, which indicate the importance of bioenergy in their energy policies and the role of stakeholders to influence bioenergy development in those countries. The study found that the stakeholders’ perceptions of bioenergy were not uniform and varied considerably even within a particular stakeholder group. More support for second- and third-generation biofuels is apparent compared to corn-based ethanol production. Factors such as age, gender, education, income level, and land ownership appear to influence stakeholders’ perceptions of bioenergy. The paper recommends raising awareness of bioenergy among different stakeholders and involving them while planning future bioenergy projects to improve their perceptions of bioenergy and reduce the chances of opposition. There is also a need for enhancing collaboration between renewable energy and educational policies so that young students become aware of bioenergy and can act as agents of change in our quest for renewable energies.